Adoptive transfer of antigen-specific T cells has proven to be an effective and powerful therapeutic tool in the prevention and treatment of viral infections (e.g., cytomegalovirus [CMV], Epstein-Barr virus [EBV], and adenovirus) and virus-associated diseases, such as EBV-associated lymphoproliferative disease (LPD), that arise in the immunocompromised host. This therapeutic approach has also been extended to the treatment of cancer and has shown some success in patients with melanoma and EBV-associated malignancies such as Hodgkin’s lymphoma and nasopharyngeal carcinoma. However, this strategy has been less successful in other malignancies. 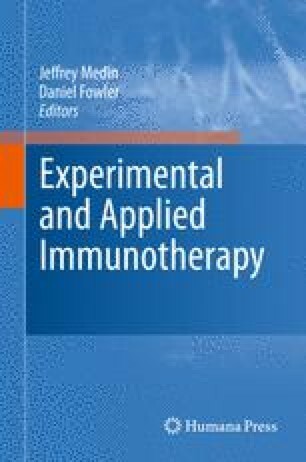 To improve the efficacy of adoptively transferred tumor-reactive T cells, a number of groups have sought to identify better immunotherapeutic target antigens and to design protocols for the optimal in vitro propagation of tumor-reactive T cells, which are often otherwise anergized or tolerized. Another approach that has recently come to fore involves the genetic modification of T cells using genes that confer properties such as new antigen specificity, improved homing to tumor sites, or increased resistance to tumor immune evasion. This chapter evaluates recent advances in tumor immunotherapy, including T cell engineering, and speculates on the future potential of adoptive T cell transfer in the field of cancer therapy.